For the longest time in my life, I had always wanted to go on a Safari in Africa. Having watched David Attenborough’s series on wildlife in Africa, I decided that one day I would go on a Safari and fulfil something that I had been yearning for many years- and let me tell you- the experience was memorable and will forever last in my heart. 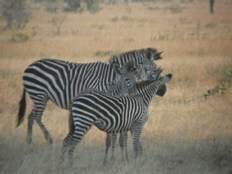 I had read about the wildlife safaris in Africa for many years but was undecided where to go. Africa is home to many world famous national parks that include Tsavo, Serengeti, Kruger, Amboselli, Virunga, and Etosha. However, the one name that is not on the list is Luangwa National Park located in Zambia. Many people know of Kruger and Sergei National Parks but Luangwa National Park is not so well known- it has largely been undiscovered and untouched until recently. Luckily, it is a hidden gem. 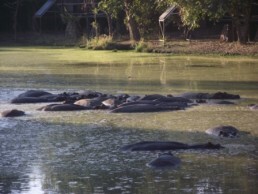 While many people may not know it, Zambia has some of the best wildlife reserves on the African continent. Besides the prolific concentration of wildlife, Zambia is also home to the world famous Victoria Falls located in the southern part of the country. So after reading about the country, I decided I was going to go to Zambia and the adjacent countries. This was my first African Safari trip and I had the time of my life. 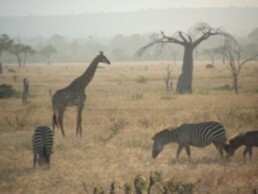 In the subsequent blogs, I will be adding to my adventures in Africa. However, readers should note that the majority of travelers who go to Africa go on an inclusive trip. There are many commercial travel agencies who offer a package deal that includes hotels, airfare, local transportation, and meals. These companies also offer various types of packages- from luxury travel to economy packages. One can go outside of an inclusive trip but that does require a lot of planning. Plus, if you start to book independent trips and tours while you are in Africa, it is also more expensive. The other downside is that in many small places they do not always accept credit cards. With an inclusive trip, you can tailor make it to your specifications. For first timers, an inclusive trip is highly recommended, as one does not require knowledge of where to go and what to see. 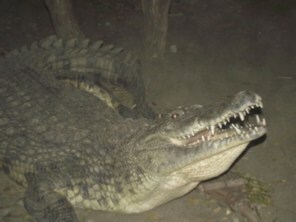 With an inclusive trip, there is also a group, so you tend to feel safe. Since this was my first trip to Central Africa and I had no idea what to expect. But the moment we got to the National Parks, I knew I had stepped back on the African continent. 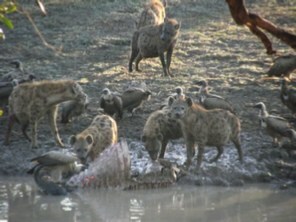 It was not only the animals but also the entire environment and scenery from times past that seemed unreal. 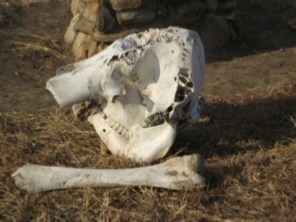 The African wildlife experience was unnerving, unique and above all magical. After having spoken to many people about their safari experiences, I decided to take a spontaneous safari trip without much planning. I went from England to Johannesburg without even booking a hotel. Fortunately, I was lucky to get a hotel for the night and explore Johannesburg, and then next day I flew early from Johannesburg to Victoria Falls Zimbabwe side where I spent several days exploring before crossing the border into Zambia. 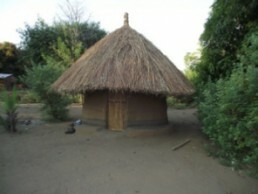 It was here that I booked my Central African tour. I then joined an overland tour, which included a trip to Victoria Falls, a truck tour through Zambia, Malawi and ending up in Tanzania. Once the central African tour was over, I then took the truck tour all the way to Dar es Salaam in Tanzania where the tour ended. The truck overland tour lasted 15 days. In each of these countries I experienced something spectacularly different. I started my trip from Livingstone, the former capital of Zambia, named after David Livingstone. This small town lies just a few miles north to the Zambezi River and is a major touristic center for visitors who come to see Victoria Falls. Over the past decade, Livingstone has seen resurgence in tourism and has become the destination of choice for many European travelers. After arriving in Livingstone, I then spoke to several people at the hotel and booked my overland tour. 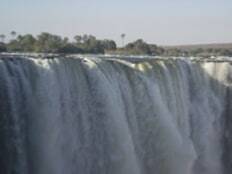 The next day we set off for Victoria Falls, which is located on the Zambezi River. Mind you this is not a short journey. After the long flight from England and Johannesburg, I was feeling a little tired but the outdoor atmosphere and changing landscape soon revitalized me. We arrived at the Victoria Falls location and camped overnight. The night sky was clear with a bright moon and everywhere we could hear the sounds of wild animals and the thunder of water in the distance. The next day we entered Victoria Falls National Park and went to one of the most beautiful and rugged waterfalls on this planet. 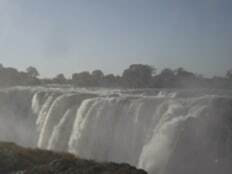 Victoria Falls is also referred to as “smoke that thunders” and is every bit as impressive in real life as it is on TV. The power of the waterfalls with its thunderous roar was also frightening- but there were a few die-hard tourists who went close to the edge – one mistake and there is no turning back. I let this chance to be brave slide by. 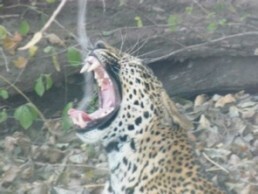 The rest of the time was spent at Victoria Fall National Park seeing wildlife. This inclusive safari did have many other optional excursions that included sunset boat cruises, horseback safaris and swimming in Devil’s pool. There is even bungee jumping for those who have nerves of steel. The jump is made from the Victoria Falls Bridge that connects Zambia to Zimbabwe. One look at the depth below and the raging waters told me that this was not for me- it was just as scary standing on the bridge looking down, I again declined this offer on this occasion. For those who want a more scenic option of the surrounding landscape, one can take a flight in a fixed wing plane or a helicopter. 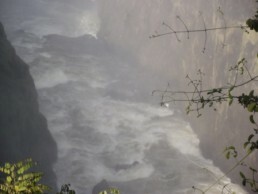 After seeing this majestic falls we then headed NE towards Luangwa. 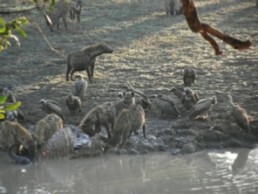 South Luangwa is the leading national park in Zambia and one of the prettiest in the continent of Africa. Located along the Luangwa River, this remote national park has one the best wildlife sanctuaries on this planet; over 400 bird species and at least 60 large animal species concentrated chiefly along the Luangwa River. 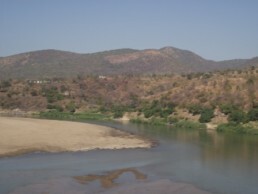 While the National Park is huge and best viewed in a vehicle, it is also unique as it offers a walking safari in certain designated area. The Luangwa National Park is said to have pioneered walking safari, which is safe and just as exhilarating as being in a truck. Of course, there are guides around who ensure that you do not do anything foolish. Because I had gone during the summer, it was very hot and humid. So the walking tours are best done in the early morning. 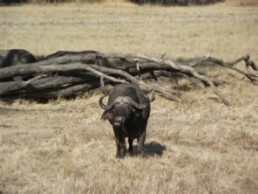 The walking safaris do allow you to see big animals like elephants, rhinos and buffalos. This is not a place where you can opt for a cold beer- it is as raw as it gets. The landscape is arid and it can get tiresome. The one thing about these walking tours is that the less you carry on you, the more likely it is that you will enjoy the scenery. Besides wildlife, Luangwa National Park is also well known for its lush tropical vegetation and exotic wildflowers. 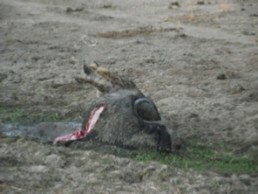 One of the highlights of my trip in South Luangwa National Park was seeing a live animal kill. 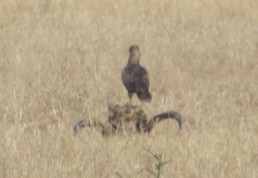 In the distance while driving at a slow pace we saw a leopard pounce on a buffalo. 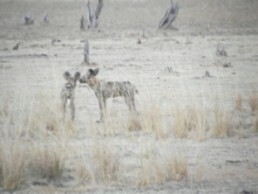 However, as we raced to get a closer look, a hyena had already converged and scared off the leopard. 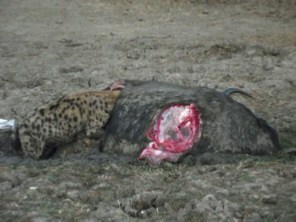 Within a few minutes, the fierce and rugged looking hyena had already begun ripping the buffalo apart. Once close up, I could hear the strong crunching sounds of the hyenas jaw as it were chewing on the bone and ripping the tendons and ligaments apart with great ease. 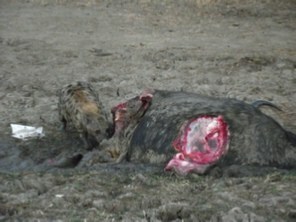 Horrific way to die but that is nature on the African plains. There is no sympathy and death is usually quick. Because of my budget limitation and a desire to experience something unique, I had opted for the tents for rest during the nights. While this did sound exciting, I did question my sanity at least once. One close encounter that I remember is waking up in the middle of the night while sleeping in a tent at South Luangwa National Park. 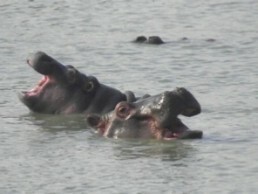 The sounds were harsh and included grunts and groans made by hippos just fighting outside the tent. 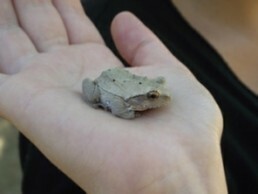 This experience was scary but exhilarating. One has to remember, hippos kill more people in Africa than even snakebites. 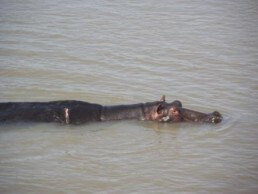 However, I was warned by the rangers that once I got inside, I should not leave the tent at night as hippos do come out of the water in search of vegetation and can get quite close to the tents. 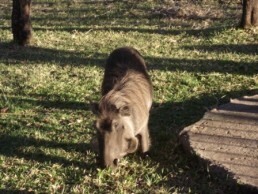 I wonder what would have happened if an errant Hippo decided to come inside my tent!! 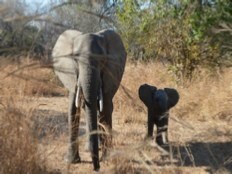 Overall, South Luangwa National Park met more than my expectations. 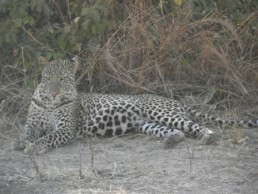 We saw almost every type of wildlife possible and that included wild dogs, elephants, zebras, giraffes, big pythons up trees, hippos, buffalos, crocodiles, as well as all the other normal wildlife you see in Africa, However, the only place I saw leopards was in South Luangwa National park. 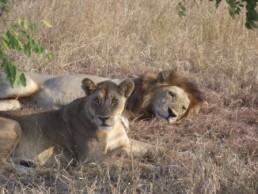 The only place I saw lions was in Mikumi National Park. 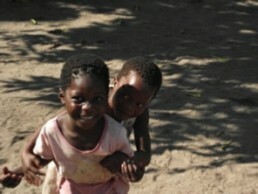 After leaving Zambia we headed further South-East and entered Malawi. Known as the “warm heart of Africa” this land-locked country is known for it friendly people, all year round warm weather and one exotic beautiful fresh lake called Lake Malawi. The atmosphere was serene and soothing. Over the next few days, we crossed the full length of lake Malawi, stopping over at various inlets and bays and spending time at the unspoilt beaches. 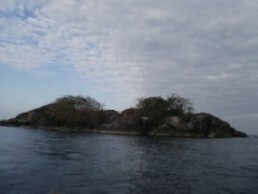 The waters of Lake Malawi are teaming with fish, which is often the main dish served to tourists. 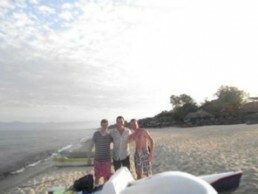 Another incident of note happened in Malawi while we stayed at a beach was a near drowning. One day we rented a pedal boat to explore an island off the beach. After exploring the island we decided to head back but discovered that our boat had sunk and was full of water. Luckily we had tied the boat to a tree. We were now 1 mile away from the mainland and decided to empty the boat of water and pedal back as fast as we could. However, as we neared the mainland the pedal boat again started to fill with water and the steering broke. It was real scary because we were not even sure what type of marine life was present in these waters. 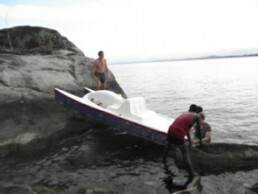 With one person rapidly emptying the boat, we pedaled as fast as we could and eventually got back on land- a close call. The only blessing was that one person brought along cake which unknown to me, it turned out to be hash cake and all of us ended high on this cake and none of us really appreciated the danger we were in. The days passed quickly and we were soon headed to Dar, where our tour would come to an end. The drive went through many scenic routes and we encountered lush vegetations, large hills, curvy roads and dry barren landscape. Along the trip, one also gets passes by the huge green tea and banana plantations. An overnight stay in Iringa at rustic farmhouse famous for its amarule hot chocolate and hot showers was the highlight of the journey. The following morning, the trip continued up north until we arrived at the capital of Tanzania Dar es salaam, where my overland truck tour came to an end. I then had no further plans again so decided to hop on a ferry and go explore the nearby island of Zanzibar. The only thing I would do different is not to go alone; the trip was great and I got to meet lots of adventurous people like me. However, the beautiful sunsets and the exotic lodges reminded me that the next time I should come with someone special and share this once in a lifetime experience. What was the total cost of the trip? All in total the whole trip cost £2,500 that included all flights, food, hotels, ferries, tour, and the safaris. The truck tour itself cost £600, which included food, tents, and the truck safari. There were other overland tours that were twice as costly; so you better do your homework well especially if you are on a tight budget. Inclusive trips from England for 10-14 days can cost about £3,000- £4,000 per person. This price includes all flights, transfers, twice-daily safari activities and full-board accommodation. The price does change slightly depending on the season. Did you have medical insurance? 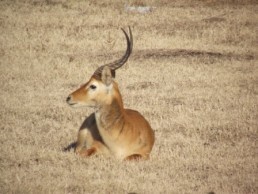 I did have travel and medical insurance because getting sick on a safari in the middle of nowhere is no piece of cake. Do you recommend this trip and why? Yes, I recommend this trip to everyone; it is a must do once in a lifetime and it was fantastic to see so many wild animals, it is so different seeing them in the wild compared to a zoo. I also recommend seeing the different villages and schools in Africa because it gives an insight how different the lives of some people are, and in some ways how lucky we are. 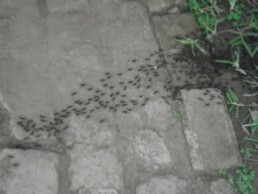 It is best to go in the rainy season or what is known as the emerald or green season. The reason is that at this time the wildlife is on the move in search of greener pastures, the scenery is exotic and changing and the landscape is lush. 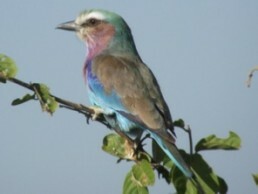 The flooded rivers also allow you to see the birds in difficult areas by boat and also see the different flowers. Plus, the rates to enter the national park are less, there are fewer people and the photographs can be good enough for national geographic. On the negative side, the lush vegetation can hinder visibility, the roads are messy and cars get stuck in the mud. The rainy season starts in early November and continues until the end of March. During the dry season, the animals are on the move known as the mass migration for greener pastures but Africa does tend to get very hot and humid at this time of the year. Your posting is ablotusely on the point! The Veggie Vagabonds Won The Liebster Award!